The possibility of success in a business-to-business context is irrefutable linked to your client’s success. You must start with the right intent. Your goal must be to help your clients succeed, not merely to sell them your products and services. When your potential clients see your intent, they too can relax knowing they’re in safe hands. Ian Brodie in his blog, Intent Is More Important Than Technique, suggests before you go into any sales meeting, ask yourself some questions; What are you trying to achieve? What do you want your clients to feel and experience? Get that clear and you’ll see a difference in how they react to you, says Brodie. He likens this to magic lessons he received from Roberto Giobbi, famous magic author, inventor, collector, and one of the world’s leading teachers. Roberto asked Brodie what he was trying to achieve with his magic. What he wanted his audience to experience and to feel as a result. Was he trying to fool them? Amuse them? Astound them? Make them laugh? Give them a once in a lifetime experience of sheer wonder? And who was he trying to be? 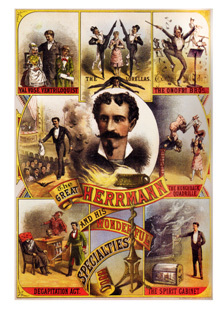 A suave entertainer, a clown, a skilful cardsharp? In magic, says Ian Brodie, intent is more important than technique. If your goal is to entertain your audience, if you’re playing with them, rather than trying to outwit them – then they play nicely back. Rather than your performance being you trying to impress them – to “make” them laugh, to “make” them like you – it becomes one where you work together with the audience to help them have a good time. When they know they’re in safe hands. That you’re not trying to make fun of them or embarrass them. Then they can relax and enjoy the ride. Mahan Khalsa, in his consultative sales book, Let’s Get real or Let’s Not Play, shares a key belief that intent counts more than technique. He goes further by suggesting a corollary: you are more successful when you concentrate on the success of other rather than your own. I believe, your own success follows as a consequence. Khalsa concedes though – technique is still important. As in the world of magic, clumsy technique spoils the illusion, breaks the spell. Communication skills and critical thinking coming from your domain of expertise are techniques that need to serve your intent if trust is to be built. Khalsa says that clients must trust that your intent is compatible with their best interests, and that you have the expertise to design and deliver solutions that meet their needs accordingly. Clients assign to you an intent largely based on the impact of your dialogue, says Khalsa. I suggest clients confirm that intent by your actions. The experience of intent becomes a reality when you take responsibility for mutually agreed committed action with integrity – doing what you said you would do when you said you would do it. When trust builds, clients are more likely to share their beliefs about what success mean to them and so the dynamic continues.